We all know that nail biting is a bad habit, but do you know why? The dental team at Aark Dental Centre at Coquitlam Centre want to clarify why this habit is so detrimental to your overall oral health. Nail biting is a common habit within certain age groups, including children, teens and young adults. Stress often triggers nail biting, and can diminish as you get older. However, nail biting should be stopped at a young age because it is unclean and unhealthy. It’s unsanitary. Nails are filled with dirt and they’re even filthier than your fingers. If you bite into your nails, germs will easily get into your mouth and help the spread of bacteria. Chewing objects is bad for your teeth – When you bite your nails, your teeth will be chewing constantly. The motion of chewing wears down teeth quite fast and puts stress on your teeth which can cause them to misalign. They harm braces – If you have braces, you know how much pressure is placed on your teeth. If you want to add to this pressure, biting your nails is a great idea! This will stress your teeth out and weaken them, harming your orthodontic treatment and your overall bite. 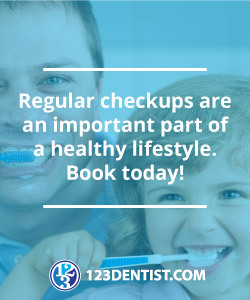 It can end up costing you – You wouldn’t think that nail biting would be an expensive habit, but it can end up costing you up to $4,000 in extra dental bills during your life! So what can you do about your problem? Just knowing the facts and how damaging nail biting can be should help you take action and kick that habit for good. The dental team at Aark Dental Centre at Coquitlam Centre can answer any questions you might have about nail biting. Contact us today!